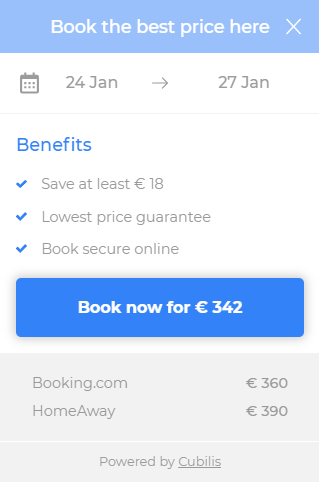 Cubilis Ratebox appears on the homepage of your website and compares the prices of your own website with those of other booking sites. The best price of your own website is highlighted to stimulate the cheaper direct bookings. Show your guests that they can book their vacation for the best price on your website and convince them by mentioning extra advantages of a direct booking. More direct reservations, less commission! Your website visitors can select their arrival & departure date in order to compare prices. The new design allows you to add 3 extra advantages. Can your guests enjoy a free breakfast when booking 3 nights? Show this special promotion and increase the chance of getting direct reservations. More and more people book their vacation through mobile devices. The new design does not only look better, it also works optimal on each device: desktop, tablet or smartphone. Personalise the Ratebox in order that it fits the look & feel of your website. Change colours and texts according to your wishes. Cubilis Ratebox is a free add-on to Cubilis Booking Engine and Channel Manager.